1. Preheat oven to 275°F. 2. 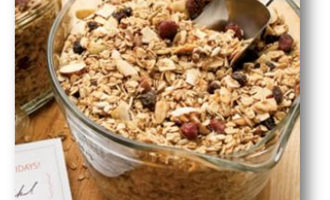 Combine oats, coconut, almonds, pecans, brown sugar, pumpkin seeds and sunflower seeds in a large bowl. Combine syrup, water and oil in a medium bowl or large measuring cup and pour over the oat mixture; stir until well combined. Spread the mixture into a large (12-by-15-inch) roasting pan or large rimmed baking sheet. 3. Bake for 45 minutes. Remove from the oven, stir, and continue baking until golden brown and beginning to crisp, about 45 minutes more. Stir in cranberries and raisins. Let cool completely before storing.